A universal hot and cold water distribution pipe system designed for use within the commercial and domestic environment. The flexibility of the system allows it to be installed in almost any building, pre-wall, in-wall or surface mounted. Without the need for bulky fittings, the system can be installed into tight spaces. The system can be used with an operating pressure of up to 10 bar allowing its use in pressure systems. This is a specialist system which must be installed using proprietary Geberit Mepla tools. 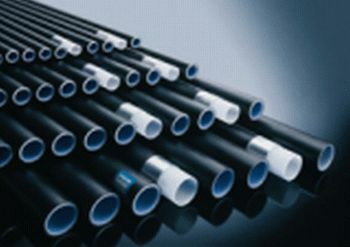 The triple layer pipe consists of an inner layer of cross linked polyethylene, a middle layer of welded aluminium, and a protective outer layer of HDPE. PVDF or gun metal fittings, using a crimping process tested and approved by WRAS and Scottish Healthcare. Geberit Mepla brackets and supports.